Frogs climb. They’ve got the legs for it, and the powerful hunger on them as they emerge around now should motivate them to tackle our new addition: the stairway to slug heaven. I imagine hedgehogs and newts may also use this shallow set of creature-sized steps I made yesterday, using containers on the stairs that connect our two garden levels: the gravel path with mini pond below, and the borders and lawn up high. It had been bothering me that the frogs are more or less trapped in the lower level of the garden, while slugs and snails have the full run of the place. Then, last year, I realized that a ladder like this would work – I stuck any old pots and stones down the far side of the steps and a few days later I was so excited to spot frogs in the upper level. 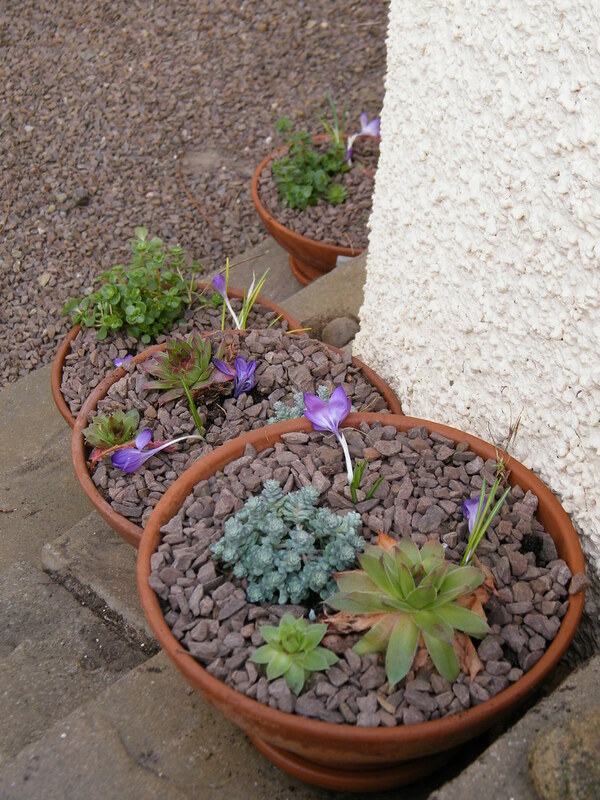 Now I’m doing a more aesthetic version: shallow hyacinth bowls filled with go-ahead-and-ignore-me sempervivums, sedums and pinks, along with a few traumatised crocus I dug up from the border. I intend to water semiannually – that’s my starting negotiating position, anyway. Behind and around the bowls are rounded stones to give creatures a leg up. 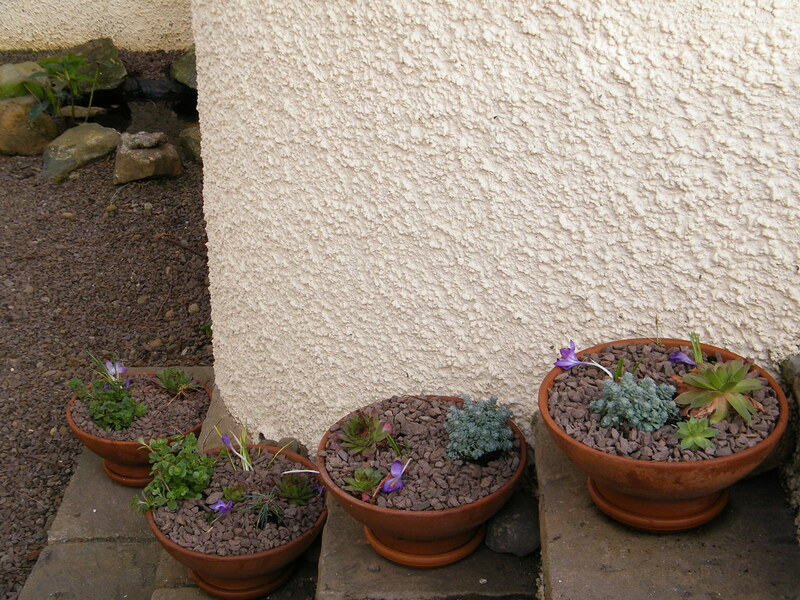 At the top, the steps aren’t wide enough for bowls, so I used a few stones with pinks tucked in behind, and bits of old plastic flower pot lining the edges to protect the masonry. As cuttings those pinks thrived on nothing last year and are now strong little plants, so I’m pretty sure they won’t mind my minimalist watering schedule. I’m not too sure why I have gone crazy for frogs – Two years ago I screamed on seeing a toad or frog in my outside space, but now I’m a changed person. Not only have I built them their own ladder, I’ve also filmed ten minutes of a frog fruitlessly stalking a slug, a video which I can still watch with great interest all the way through. I think I used to scream at them because I felt they were terrifying vermin invading my space. Now I see the garden as their space, and my job is to make them feel at home. Anything special you’re doing for the creatures in your garden this year? Wonderful idea! We keep a few wet areas under the North facing walls with lots of rocks piled up for the frogs. We also leave an outdoor light on so they can have a night time meal of moths. This is a good and (importantly) simple idea! In the Pacific NW USA we have a huge introduced slug problem, as well as our own dear rainforest banana slugs, which I celebrate. Thanks Kate! Another Kate I know keeps her “dead” growbag after the veggies are done for the year, and many frogs hibernate under it. I like the moth idea, would a solar light still attract moths, I wonder? Hi Jeanie, I’ve heard about your slug problem…I listen to the (now much reduced) greendays podcast on KUOW and heard a show all about the slugs once. Thanks for your comment! I’ll let you know of the frogs like my construction. I love this post! A very thoughtful project to invite your garden visitors to enjoy all that your garden has to offer. Now it has me thinking about what I can do this year. Thanks for the nudge! What a clever way to invite the natural slug-control team into your garden. Jean thanks, hope all’s well in your garden! I love frogs and am so disappointed that we have no frogspawn in the ponds this year. I would never have believed that frogs could manage your steps if you hadn’t now found them at the top of the garden – the steps seem so large. They are a pretty solution too! I have built a hibernarium for the frogs in my garden – a pile of rubble with plants over the top – to give them somewhere to hide up over the winter. Sarah – I’ve seen one of our frogs so far this year but that’s all; I’d love to see them using the ladder, but it wouldn’t be right to plunk them on there and just snap a photo (*ponders the ethics of this*). if you have the sensation that your slug count is going down, it’s probably true. By the way have you heard this slug rap from Can You Dig It? Frogs need to be encouraged they have had a hard time lately with there numbers decreasing due to loss of habitat, chemicals used in gardens etc. 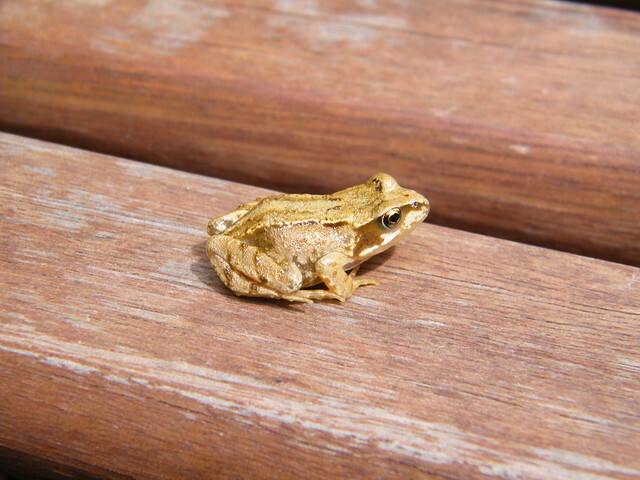 Every year I hear the croaking I know spring is here.